Container leasing means increased flexibility. Certain lease options allow a carrier to leave a container at the trip destination. This flexibility can save costs, because the carrier does not have to incur a cost to reposition the empty container. In periods of high demand, a carrier can lease additional containers as opposed to incurring the high capital cost of buying containers that might be redundant in periods of lower demand. In some circumstances it is thus more economical for carriers to lease containers to meet their business needs. 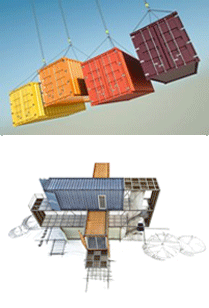 However, container lease tends to be more expensive than owning a container. It is estimated that the daily cost of a leased container is approximately 60 to 70 percent higher than an owned container. Leasing is also less attractive in Africa, South America, and the Caribbean, largely because leasing companies do not have depots in these countries. Because of this empty leased containers have to be repositioned at a high cost to regions of higher demand. Repositioning of empty containers is a major expense for leasing companies. In areas of container surplus, such as New York, Miami, Rotterdam, and London, leasing companies have started to close their depots or to charge shippers a repositioning fee. Transamerica, the largest leasing company for containers, decided to charge shippers a repositioning fee rather than to close any of their 300 worldwide depots. The repositioning fee for a 40-foot container from New York to the Far East ranges from $800 to $1,000. Most of the freight forwarders leased their containers from ocean carriers. A number of different lease options exists. Apparently, a major benefit associated with container leasing from ocean carriers is that the ocean carrier is responsible for repositioning the container. The container leasing company makes available various container lease options, ranged from short-term spot leases to long-term master leases.